A Cornish company has begun harvesting sea salt near the remains of an Iron Age salt production site. Salt was once a strong trading commodity in the county and was used for centuries to pack Cornish pilchards for export. An increasing interest in British food culture has seen an increased demand for local sea salt. Now Cornish Sea Salt is harvesting the mineral about 8m (26ft) from the sea at Porthkerris on the Lizard. 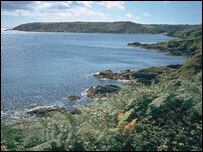 Tony Fraser, the company's managing director, said it was a chance visit to the Iron Age site on the Lizard which inspired him to set up the production plant. "I've always been interested in local history and it was seeing the fascinating ancient salt site that set the idea off in my head," he told BBC News. "Locals would burn gorse to heat up clay pots and boil away the sea water, before smashing the pots open to get to the salt. "The fundamental process is evaporation and we're pretty much using the ancient technique, but in an energy-efficient way." The production plant, which is less than two miles (3.2km) from the Iron Age site, currently employs eight people. The first harvest was produced in February and Mr Fraser said most of that was snapped up by two of the UK's top chefs, Rick Stein and Mark Hix. Cornwall-based Stein is stocking the salt in his delicatessen, while Hix is using it at his two London restaurants, The Ivy and Le Caprice. "The salt is being sold across the country and there's also been a lot of interest from Germany, Australia and the US," Mr Fraser said.